Cooper Lighting Sure-Lites® CX Series LED exit sign in brushed aluminum face with black housing finish, has die-cast aluminum construction for corrosion resistance and durability. It features a polycarbonate lens shade that accommodates LED lamps. 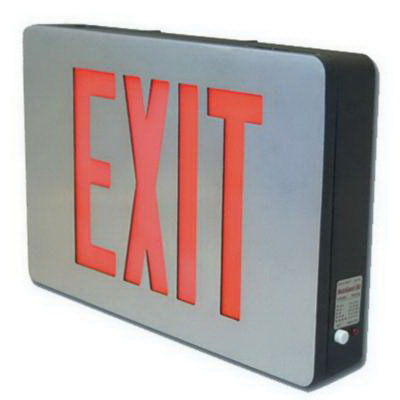 The exit sign measuring 12-5/8-Inch x 4-3/8-Inch x 8-1/4-Inch, has a voltage rating of 120/277-Volts AC at 60-Hz. It is suitable for use in damp locations. The LED exit sign meets UL 924, NFPA 101 and NEC/OSHA standards.